Those of you that have heard Carmen tell her story, Love in the Library, already know that Carmen has a special place in her heart just for E.B. White and Charlotte’s Web. It was the book that really made her love reading, which makes it mean that much more to be on the Middle Reader Honor Award list for the E.B. White Read-Aloud Award. You can view a complete list of winners and honor books here. Thank you to everyone that nominated and voted for The Cheshire Cheese Cat! So many wonderful and exciting things have been happening! 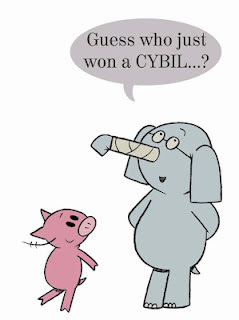 For starters, The Cheshire Cheese Cat, won a Cybil in the Science Fiction & Fantasy category! It always means a lot when the readers pick your book, especially when you’re up against so many other fabulous titles (I’m looking at you A Monster Calls!). To top off the excitement of winning a Cybil, The Cheshire Cheese Cat has been nominated for an Indies Choice award in the Middle Reader category! It is in great company, so be sure to check out the whole nominees list here. Lastly, SLJ’s Battle of the Books has officially started! Unfortunately, The Cheshire Cheese Cat did not make it to the next round. Sy Montgomery had a tough choice between two very different books. Chime went home the winner of the round, but Montgomery had some lovely things to say about The Cheshire Cheese Cat.